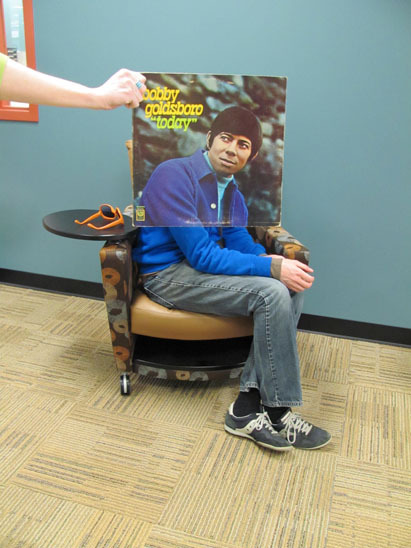 Our Library Sleevefacing portal is now over on tumblr, so head over to check it out. 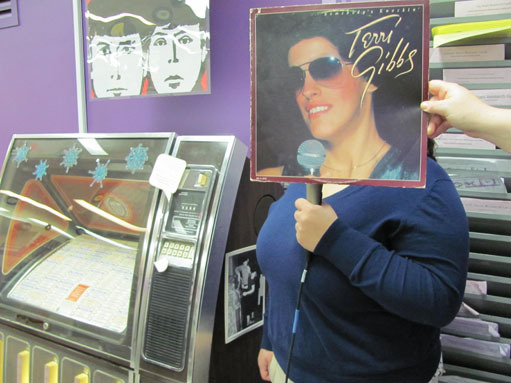 Terri Gibbs doesn’t need one of those newfangled karaoke machine when the 45s in the jukebox have instrumental B-sides. In this photo: Lori Harrison and Susannah Cleveland. Photo by Liz Tousey. With these days of cold weather and short days, you have to spend as much time next to the window as possible. Even if it’s on the floor of the library. In this photo: Katie Reeves and Susannah Cleveland. Photo by Liz Tousey. In this photo: Aby Morales and Susannah Cleveland. Photo by Liz Tousey. 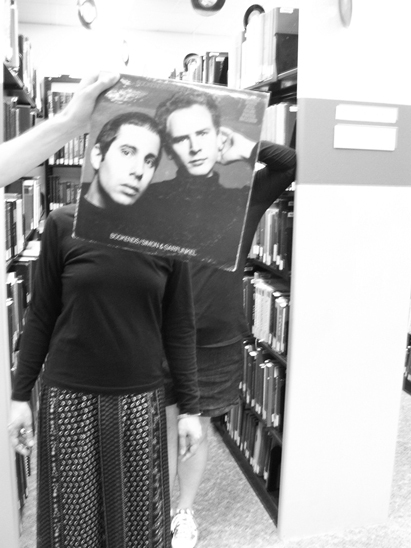 You’d think the staff wouldn’t approve of ballroom dancing in the library, but you’d be wrong. In this photo: Aby Morales, Alyssa Nance and Susannah Cleveland. Photo by Liz Tousey. 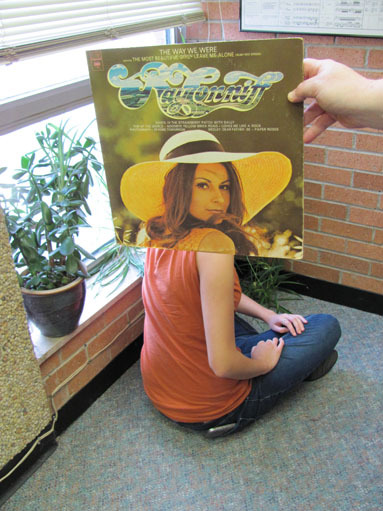 Eager to enjoy the sunshine before the weather starts turning to winter, Claudine Longet wistfully wonders why we insist on keeping most of the blinds in the Music Library closed, but is sympathetic when she learns that it’s to keep from fading the books on the shelves by the windows. In this photo: Anastasia Pantsios and Bill Schurk. Photo by Susannah Cleveland. 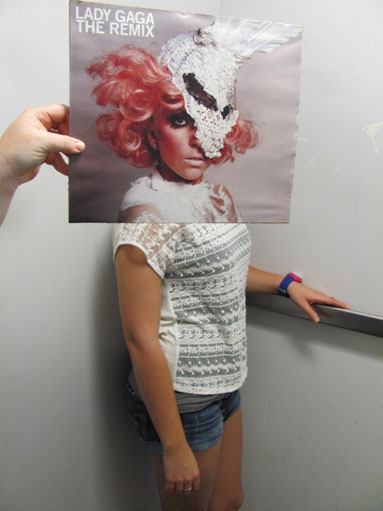 Lady Gaga isn’t particularly impressed with the interiors of the BGSU library elevator. Good thing we’re in the process of getting new ones. In this photo: Angela Martaus and Susannah Cleveland. Photo by Liz Tousey. 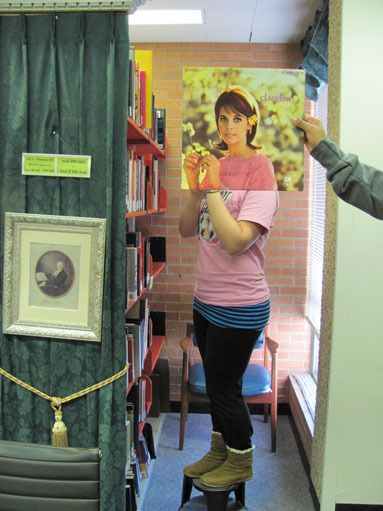 Never much of a risk taker, Claudine Longet wisely uses a kick step to reach that book on the highest shelf, rather than the “jump and stretch” method employed by so many others. In this photo: Lexie and Amber. Photo by Liz Tousey. What’s that Teddy? A Ladies Only concert at the library? Awesome. In this photo: Amber and Lexie. Photo by Liz Tousey. 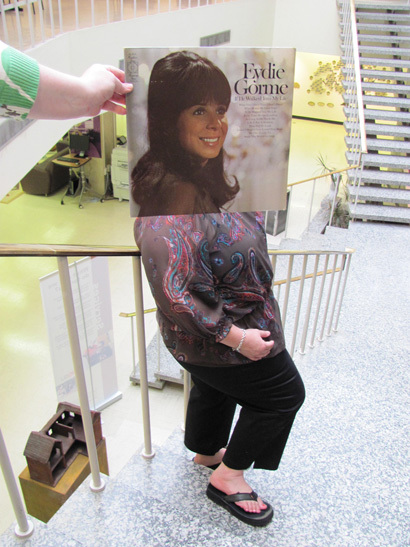 Edyie Gorme just loves library love. In this photo: Edyie Gorme, Pam, and Susannah Cleveland. Photo by Liz Tousey. 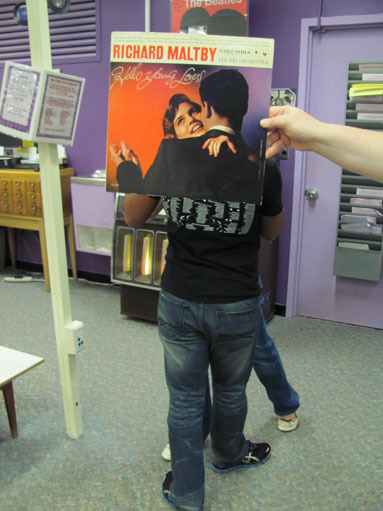 Old friends… stood in the shelving like bookends. In this photo: Simon and Garfunkel, Jonikka Justice Gaines, Susannah Cleveland and Andrew Smith. Photo by Liz Tousey. 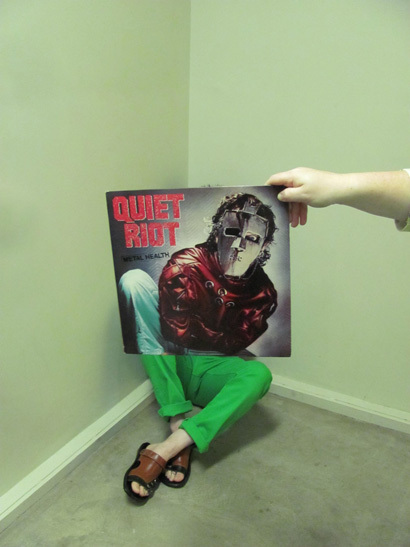 In this photo: Quiet Riot, Allan and Susannah Cleveland. Photo by Liz Tousey. Ooo la la. 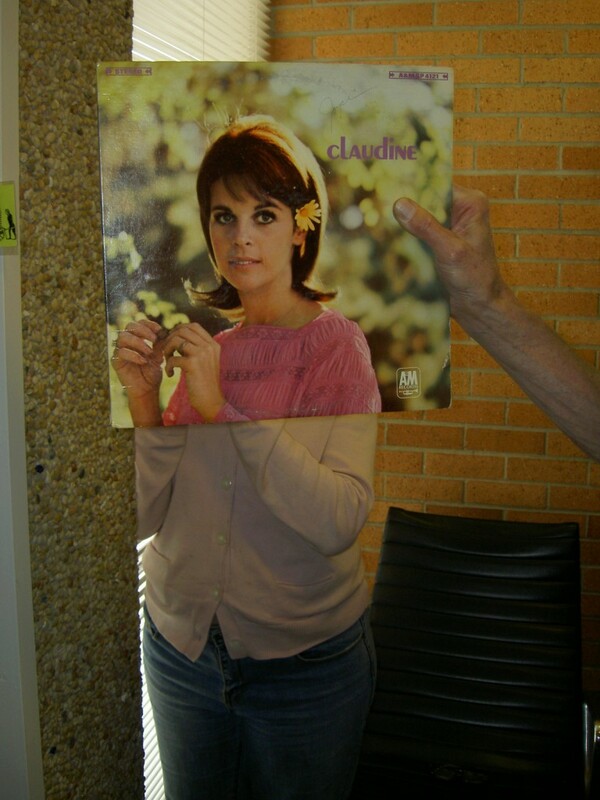 A Babs sleeveface at her most sultry yet! 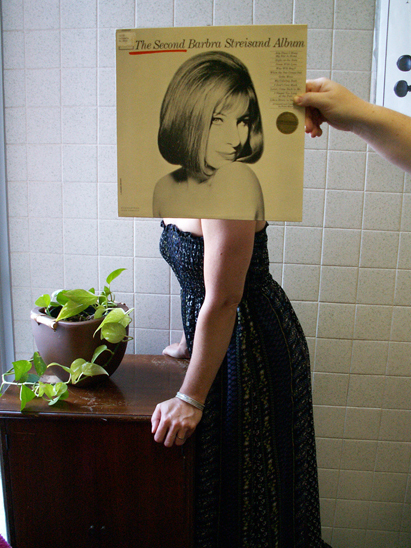 In this photo: Barbra Streisand, Jonikka Justice Gaines, and Susannah Cleveland. Photo by Liz Tousey. 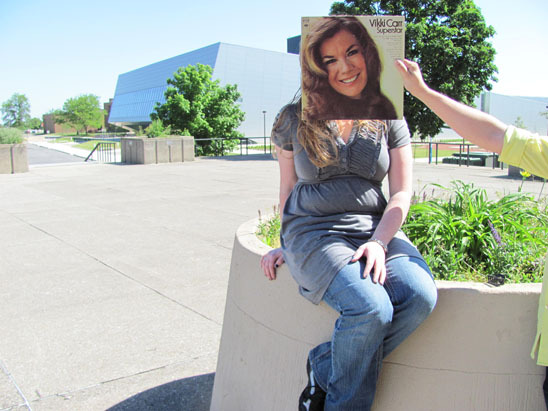 Vikki Carr just loves the way the Wolfe Center compliments her eyes and sweater. In this photo: Vikki Carr, Anne Lake and Michael Lee. Photo by Liz Tousey. 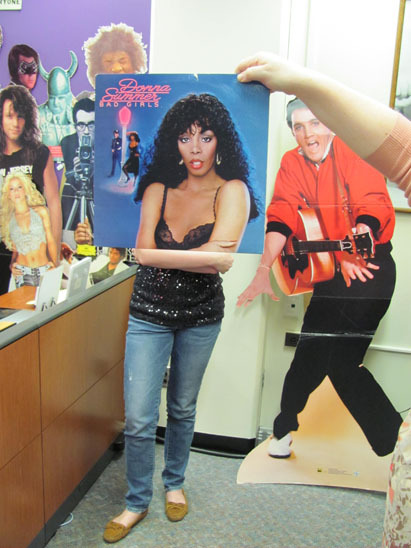 Elvis is SHOCKED at how bad Donna Summer can really be in the library. She’s not ashamed of turning in her books late or marking up scores with pencil. In this photo: Donna Summer, Sarah Modene, Elvis Presley and Susannah Cleveland. Photo by Liz Tousey. 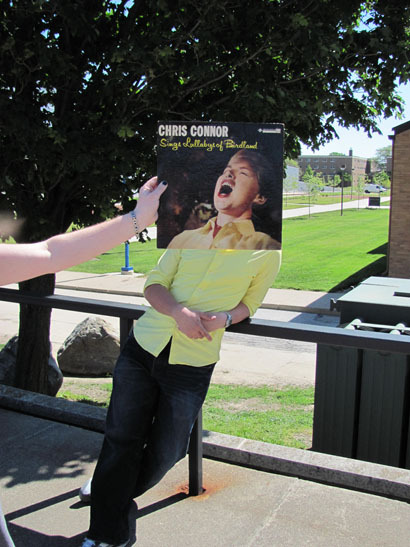 Chris Connor loves to belt out those old jazz classics on the library deck, where there’s no one to give her The Shush. In this photo: Chris Connor, Michael Lee and Anne Lake. Photo by Liz Tousey. 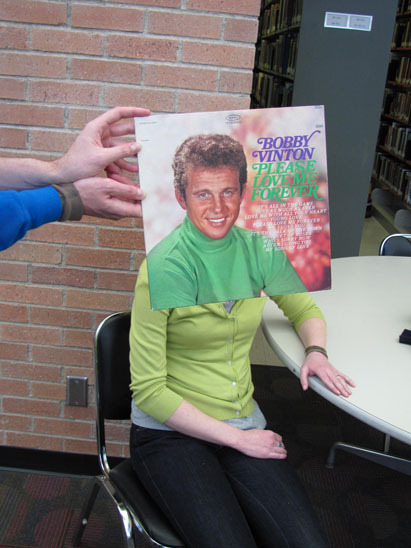 Bobby Vinton is quite pleased that it’s the last week of classes. 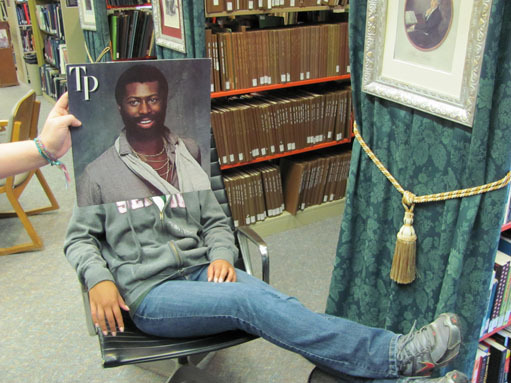 It’s a perfect time to camp out in the library while you write papers and study for finals! 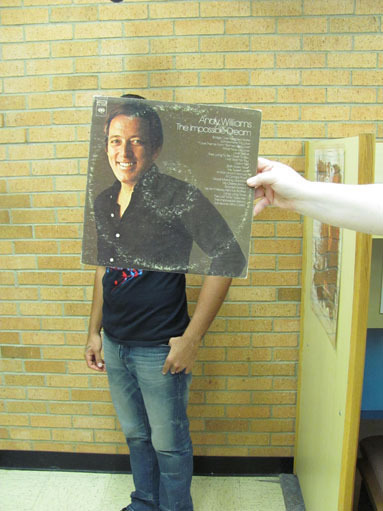 In this photo: Bobby Vinton, Pete Burkeet and April Conway. Photo by Liz Tousey. 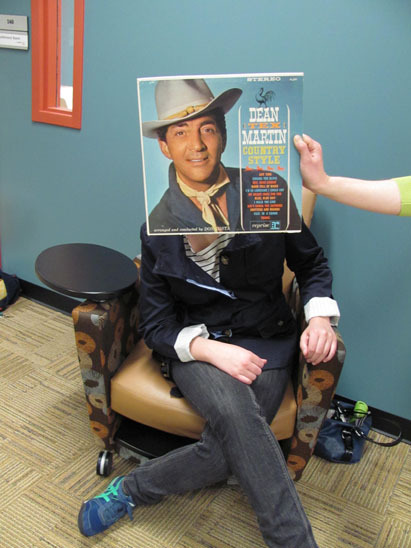 Dean “Tex” Martin is more excited than a bird with a french fry about the Study on Sunday events happening on the first floor of the library this weekend. In this photo: Dean “Tex” Martin, April Conway and Melissa Barrett. Photo by Liz Tousey. In this photo: Bobby Goldsboro, April Conway and Pete Burkeet. Photo by Liz Tousey. 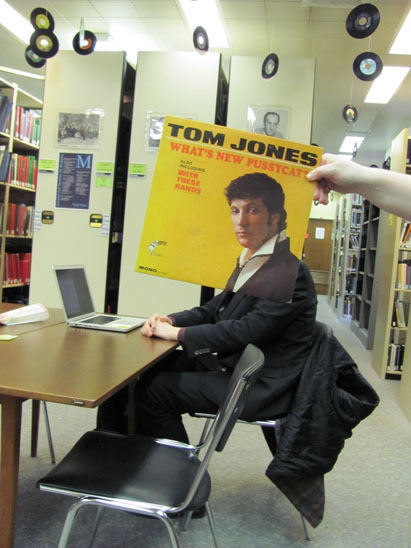 In this photo: Tom Jones and Jake K.
Posted in Pop	| Tagged National Library Week, Tom_Jones	| Comments Off on What’s New Pussycat?